As aircraft displays have transitioned to new technology, the sensors that feed them have also undergone significant change. Traditional gyroscopic flight instruments have been replaced by Attitude and Heading Reference Systems (AHRS) improving reliability and thereby reducing cost and maintenance. The function of an AHRS is the same as gyroscopic systems; that is, to determine which way is level and which way is north. By knowing the initial heading the AHRS can determine both the attitude and magnetic heading of the aircraft. The genesis of this system was initiated by the development of the ring-LASAR gyroscope developed by Kearfott located in Little Falls, New Jersey. [Figure 5-36] Their development of the Ring-LASAR gyroscope in the 1960s/1970s was in support of Department of Defense (DOD) programs to include cruise missile technology. With the precision of these gyroscopes, it became readily apparent that they could be leveraged for multiple tasks and functions. Gyroscopic miniaturization has become so common that solid-state gyroscopes are found in products from robotics to toys. Figure 5-36. 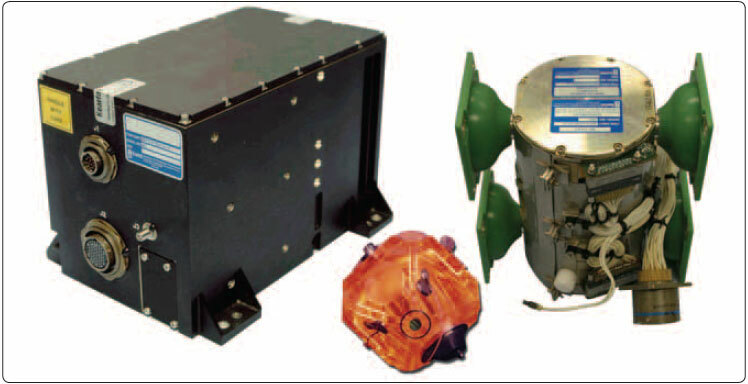 The Kearfott Attitude Heading Reference System (AHRS) on the left incorporates a Monolithic Ring Laser Gyro (MRLG) (center), which is housed in an Inertial Sensor Assembly (ISA) on the right. Because the AHRS system replaces separate gyroscopes, such as those associated with an attitude indicator, magnetic heading indicator and turn indicator these individual systems are no longer needed. As with many systems today, AHRS itself had matured with time. Early AHRS systems used expensive inertial sensors and flux valves. However, today the AHRS for aviation and general aviation in particular are small solid-state systems integrating a variety of technology such as low cost inertial sensors, rate gyros, and magnetometers, and have capability for satellite signal reception. 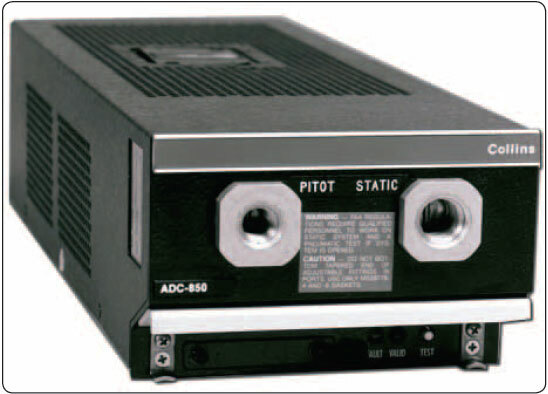 An Air Data Computer (ADC) [Figure 5-37] is an aircraft computer that receives and processes pitot pressure, static pressure, and temperature to calculate very precise altitude, IAS, TAS, and air temperature. The ADC outputs this information in a digital format that can be used by a variety of aircraft systems including an EFIS. Modern ADCs are small solid-state units. Increasingly, aircraft systems such as autopilots, pressurization, and FMS utilize ADC information for normal operations. Figure 5-37. Air data computer (Collins). NOTE: In most modern general aviation systems, both the AHRS and ADC are integrated within the electronic displays themselves thereby reducing the number of units, reducing weight, and providing simplification for installation resulting in reduced costs.